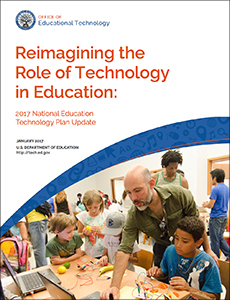 'The National Education Technology Plan is the flagship educational technology policy document for the United States. The Plan articulates a vision of equity, active use, and collaborative leadership to make everywhere, all-the-time learning possible. While acknowledging the continuing need to provide greater equity of access to technology itself, the plan goes further to call upon all involved in American education to ensure equity of access to transformational learning experiences enabled by technology. The principles and examples provided in this document align to the Activities to Support the Effective Use of Technology (Title IV A) of Every Student Succeeds Act as authorized by Congress in December 2015. You just viewed National Education Technology Plan. Please take a moment to rate this material. If you know the author of National Education Technology Plan, please help us out by filling out the form below and clicking Send.